These questions test how well you mapped the game in your original set up. Did you explore all of the possibilities in your mapping? If so, you’ll have an easy time with this game. You can answer these questions quickly. Saving time is important because there are four games and it’s a reasonable assumption that one or more will stump you into time wasting. Which of the following is always true? Which of the following cannot occupy position three? These questions present a hypothetical scenario that adds to the rules originally drawn out in your set up. So, you have to edit the Set Up for this question. Note: The changes only apply to the specific question, so ignore the change when you are done with the question. These questions are easy to spot because they’ll usually be set up with an “if” statement. If the student eats the Everlasting Gobstopper third, does he eat the Wonka Bar fourth? If the captain of the football team decides to quit and join the poetry club, who can replace him? At a state fair, the prize-winning cows of six different breeds, Ayrshire, Brown Swiss, Guernsey, Jersey, Holstein, and Simmental, are to be displayed in the central stock pavilion. 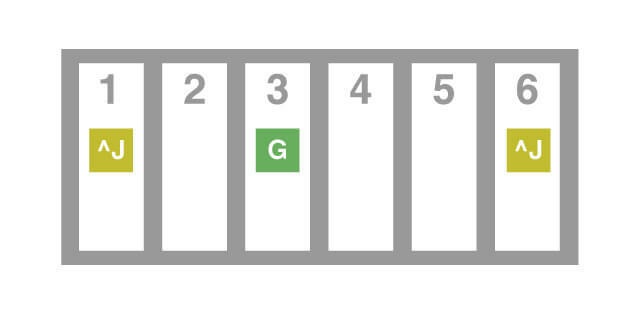 There are six stalls numbered 1 to 6 from left to right. Each cow will be housed in its own stall. The Jersey is not in either the leftmost or rightmost stall. There are exactly two cows between the Holstein and the Simmental. The Brown Swiss and Jersey are next to each other. The Guernsey is in stall three. Once we’ve read through the game set-up and conditions, let’s start by making a roster. The elements are the six different cows. Next, we need to summarize the conditions of the game. Once we have summarized the rules, let’s think about what kind of diagram would be most helpful. What sort of problem are we being asked to solve? This is a linear ordering game, as we are being asked to arrange these six cows from left to right. This situation can best be represented by six dashes, one for each stall. Next, fill in the information that follows from the rules. Begin this step with the fixed condition, G = 3. What other information can we add to our diagram? We know that J cannot be in either the rightmost or leftmost stall (also know as stalls 1 or 6). This can be translated into: J ? 1, J ? 6. 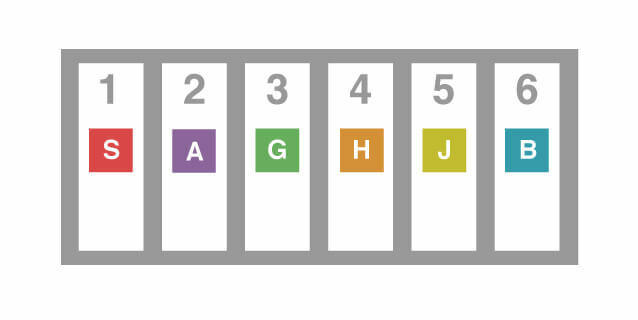 Add this to the diagram in the form ^J in stalls 1 and 6. Additionally, there are exactly two cows between the Holstein and Simmental. This can be translated as: H _ _ S or S _ _ H.
If we look at our diagram, how many ways can we fit this condition into the available open stalls? 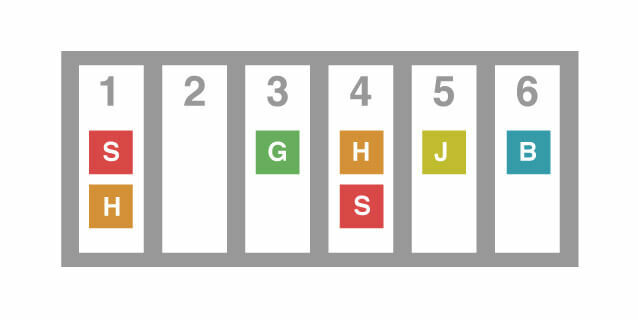 If we put H in stall 1, then S would have to be in stall 4 (or S in stall 1 and H in stall 4). Why do we write two statements? We do not yet know which cow, the Holstein or the Simmental is closest to the left. We only know their positions relative to each other, not their exact locations. When you have a flexible statement like this, you should always write out both possibilities. Next, we know the Brown Swiss and Jersey are next to each other. Now, remember we told you that often you are able to garner additional information by considering conditions together. You are also often able to make deductions when trying to fit the conditions to the diagram. We see from the diagram thus far, only stalls 5 and 6 are open for the two cows that need to be next to each other (Brown Swiss and Jersey). Since we also know that the Jersey cannot be in stall 6, we can place these cows with certainty in the following diagram. 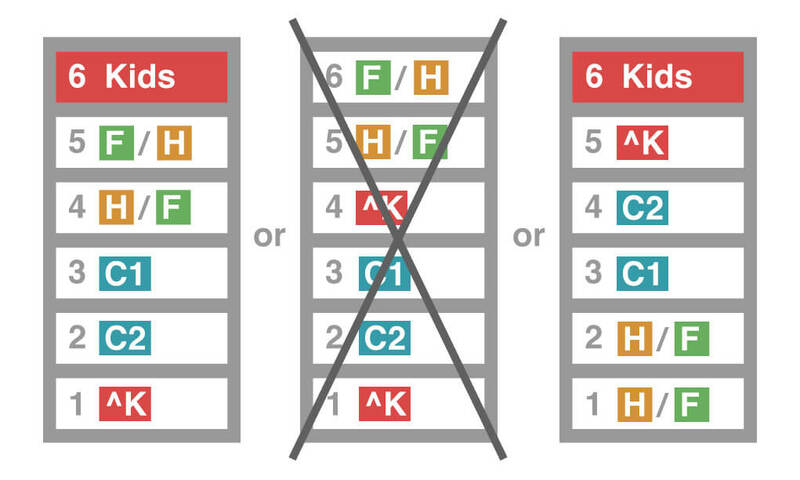 Is there any other way we can fit the H _ _ S or S _ _ H condition into the diagram? 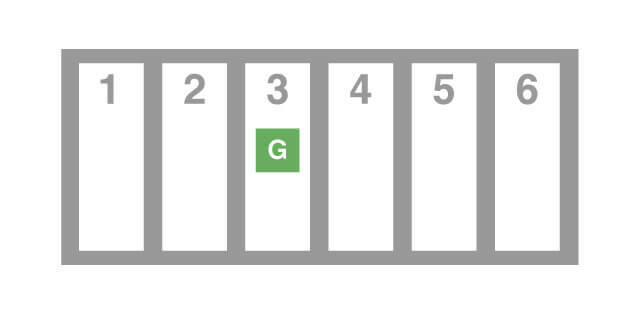 Stall 3 is already taken, but stalls 2 and 5 would be the correct distance apart. Let’s see what happens if we try to fit the H and S cows into spaces 2 and 5. When we try to fit the next condition, BJ or JB, we see that there are not two adjacent spaces available. Therefore, we can eliminate this diagram. (A) The Jersey cow is next to the Holstein. (B) The Guernsey is next to the Ayrshire. (C) The Ayrshire cow is in stall two. (D) The Simmental cow is in stall four. (E) The Holstein is in stall four. 1. To solve this, let’s look again at our diagram. We are told in this question that the Ayrshire cow is next to the Simmental cow. According to our diagram, the only stall available for this cow is stall 2. 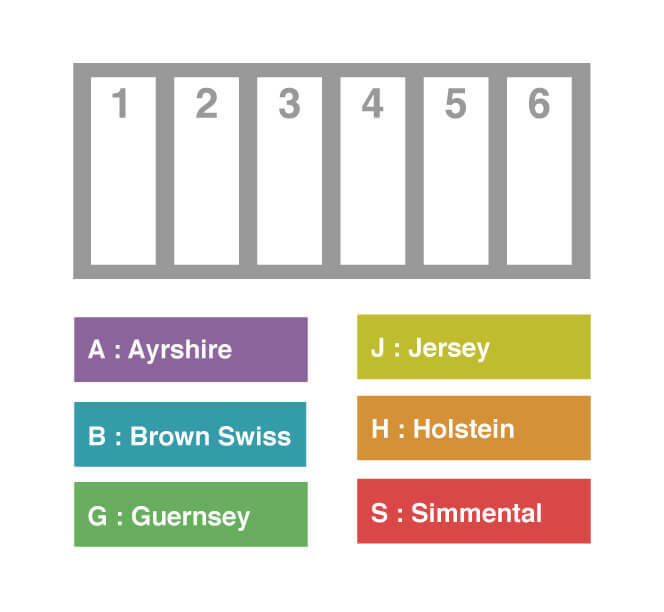 If we place the Ayrshire cow in stall 2, then in order to meet the new condition that the Ayrshire cow is next to the Simmental cow, we must place the Simmental cow in stall 1, which makes the Holstein in stall 4. Now our diagram looks like this. Now that our diagram is completely filled in, the question is easy to answer. Since it is asking which statement cannot be true, we must go through each one and check it against our diagram. Is the Jersey cow next to the Holstein? Yes. Is the Guernsey next to the Ayrshire? Yes. Is the Ayrshire cow in stall two? Yes. Is the Simmental cow in stall four? No, it is in stall one. Is the Holstein in stall four? Yes. Will we always be able to fill in all of the blanks in our diagram? Of course not. In fact, the more complicated the game, the fewer fixed elements there will be. 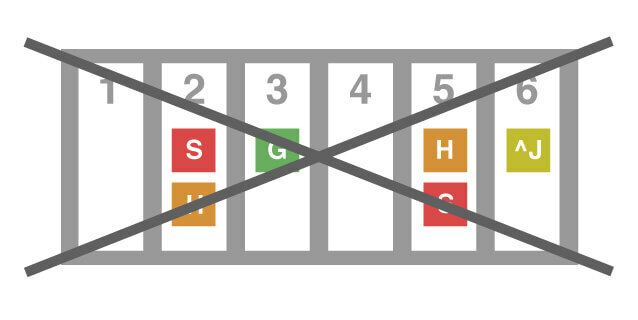 What this means is that often you will require multiple diagrams, or diagrams that have multiple options for certain positions. Veebee’s department store occupies five of the six floors in a building. On the remaining floor is a restaurant. The floors are numbered one through six, with the first floor at the bottom and the sixth at the top. Veebee’s has four departments: housewares, kids, furniture and clothing. Each department occupies a separate floor except the clothing department, which occupies two adjacent floors. The kids department cannot be located on a floor immediately above or immediately below a floor occupied by the clothing department. The housewares department is either on the floor immediately above or immediately below the furniture department. If the clothing department occupies the third floor, and the restaurant is not on the second floor, which of the following must be true? (A) The kids’ department is on the sixth floor. (B) The fourth floor is on the same floor as the clothing department. (C) Furniture and housewares are on the top two floors. (D) The kids’ department is on the first floor. (E) The restaurant is on the fifth floor. Which of the following, from first to sixth, represents a possible arrangement of the departments and restaurant? Does fewer conditions mean the game is more simple? It may actually have more possibilities because there are less restrictions. First let’s create the roster, in this case the different departments. Note that in this case, one of the elements (clothing) takes up two spaces (two floors). 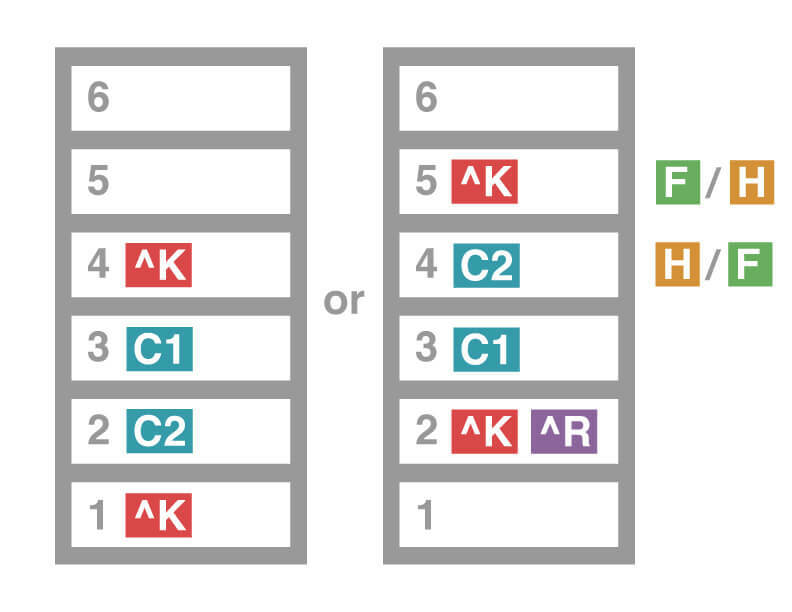 To help us remember that when designing our diagram, we can call these C1 and C2. What kind of diagram should we use? 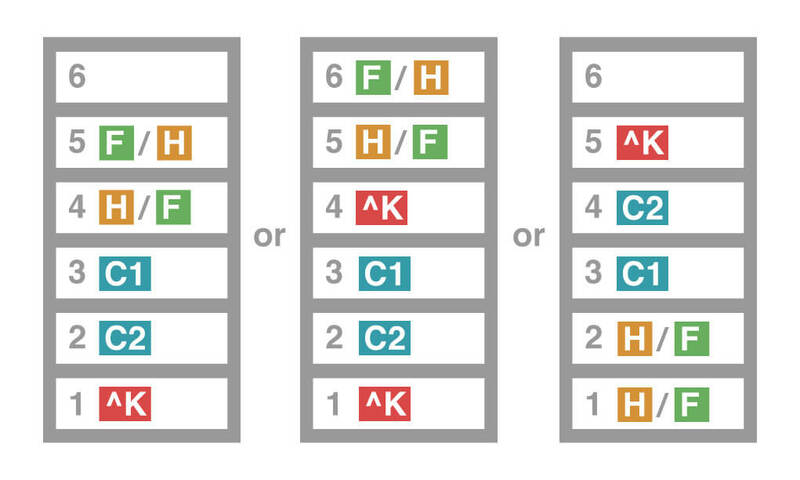 This is a linear ordering game, but this time instead of arranging the elements from left to right, we need to arrange them vertically, like the floors of a building. We are not able to put the conditions onto the actual diagram at this point because we do not have enough information. 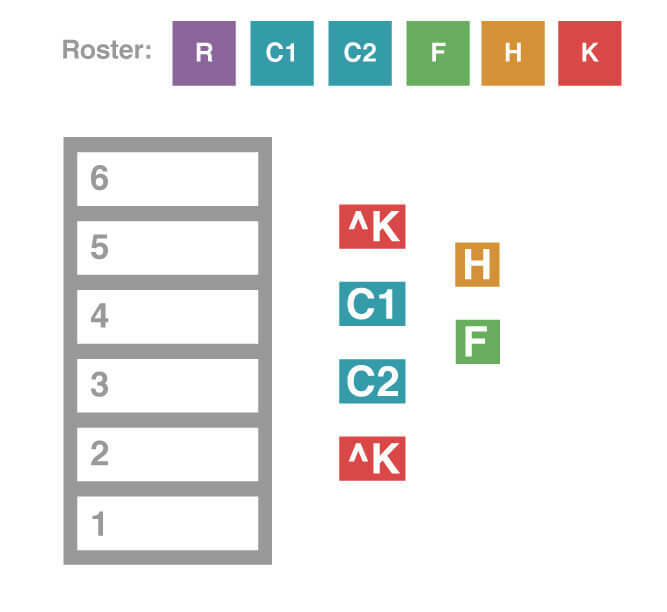 Roster: H, K, F, C1, C2, R.
If the clothing department is on the third floor, then how do the other conditions play out? Well, the clothing department occupies two adjacent floors, so that means either the second or fourth floor must also be clothing. Since we do not know which is correct, we must explore all possibilities. We are also told the restaurant is not on the second floor. Now we have two diagrams that include the information from the question. We have additional information to consider, however. We know that the housewares and furniture departments are on adjacent floors. How can we fit this into our two diagrams? 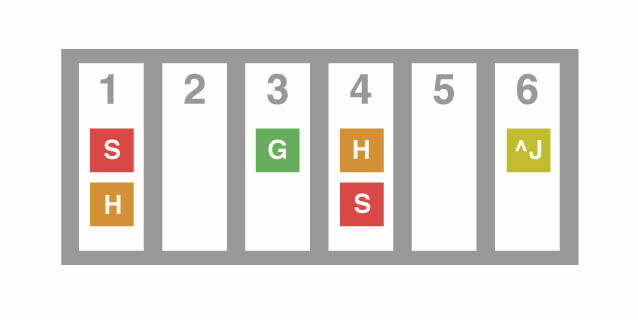 When we try to place these two floors on the first diagram, we can see that there are two possibilities for these two departments: the fourth and fifth floors or the fifth and sixth floors. For the second diagram, there is only one possible location of the two floors, so the end result is three diagrams (two derived from the first, one from the second). Now let’s try to answer the question by going through each of the answer choices. Choice A states that the kids department must be on the sixth floor. Look at the first diagram. There are two unassigned floors, the first and the sixth. The first one we have already noted cannot be the kids department, so the sixth must have the kids department. What about the second diagram? There is no space available for the kids department! So we can eliminate this diagram as a possible arrangement. In this one, the only unassigned floors are the fifth and the sixth, and the fifth we have already labeled as not able to be occupied by the kids department. Therefore for this arrangement also, the kids department is located on the sixth floor, so this is the correct answer. To be sure, let’s also go through the other choices. Choice B states that the fourth floor is occupied by the clothing department. If we look at our diagrams, in the first one, this is not true: the clothing departments are on the third and second floors. It is true for our third diagram, but since we are asked for which condition must be true, we can eliminate choice B. 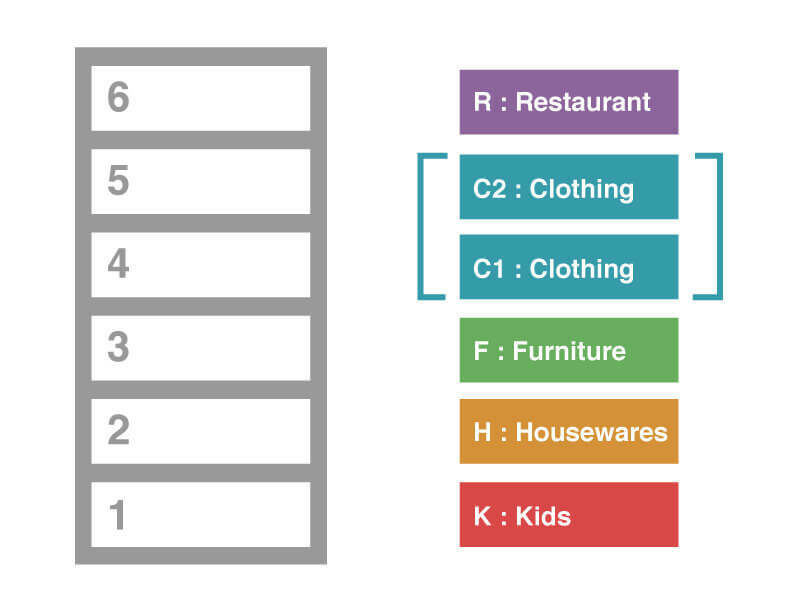 Choice C states that furniture and housewares must be on the top two floors. We can see from our diagrams that this cannot be true; instead, the kids department must be on the top floor. Choice D says the kids department is on the first floor. We have already established that the kids department is on the sixth, so we can eliminate this one. Choice E places the restaurant on the fifth floor. While this would work for our third diagram, it does not work for the first diagram, therefore this choice too can be eliminated. Let’s try another question for the same game. To answer this question, which diagrams do we use? It is very important to remember when starting a new question to not necessarily use the last diagram you made. We added the additional conditions to our diagrams that were given in the question itself, rather than in the initial set-up or the original list of conditions. These do not carry over to the next question. Instead, go back to the original diagram. Are there additional conditions we can use to fill in more information? No. We must rely only on the information we already have. Kids not immediately below or above a clothing floor. Choice A violates the rule about the kids department. Choice B violates the condition that the furniture and housewares departments should be on adjacent floors. Choice C seems to be valid, but let’s make sure by checking the last two choices as well. Choice D violates the two clothing floors being adjacent. Choice E violates the housewares and furniture rule. Therefore choice C is the correct answer.